This post has been sponsored by Lorex. Although a great many home security cameras are sold for one intended purpose — to help keep a home secure from theft or vandalism, today’s lightweight wireless security cameras make it easier than ever to put them to use in all sorts of other ways. Having security cameras cover a building’s entry and exit doors for video surveillance is a great addition to a home and can help give families peace of mind when it comes to the possibility of a break-in. Considering the excellent clarity of HD video from modern security cameras such as the Lorex Wire-Free Security Camera System, these gadgets lend themselves to a wide range of other uses. Gone are the days of grainy black and white footage from big bulky hard-wired security cameras, because with today’s technology, it’s now possible to easily get crisp clean videos and stills of just about anything you’d like, and many models include motion-activated and night vision features, along with the ability to view footage remotely. Pet TV: Keep an eye on your furry friend’s antics while you’re away, either inside the home or out; And catch your cats napping or your dogs digging under your fence. Small animals in cages are a perfect fit for a Pet TV cameo, as they’ll always be within view of a stationary camera. For larger areas, where pets may come in and out of view of a single camera, consider adding a second or third one to monitor blind spots or to provide for overlapping coverage. Baby & kid monitor: When your little one is down for a nap, a wireless camera can be sending live images to a screen in another room or in the backyard, allowing you to keep an eye on baby during nap time and to know when they wake up, without having to be right within sight or hearing distance of their bedroom. Smartphone apps or browser-based systems can be used to stream the video in order to monitor a room or area where your kids are playing while you’re working or relaxing in another location in the home. Watch the watcher: While we would all like to assume that our babysitter or our housesitter would act with the highest integrity, it’s also possible that they will raid your personal ice cream stash late at night or accidentally break something valuable, so a wireless camera can allow you to check in on the activities happening in your home while the sitter is there, or while you’re traveling. 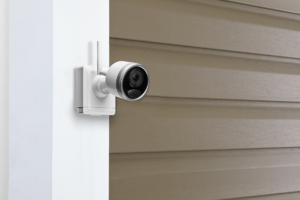 Go live: With a few well-positioned wireless cameras in the home and yard, you can live stream family gatherings, reunions, parties, and more in full 1080p resolution video to friends and relatives who live far away or are too infirm to attend. See it grow: One unique use for security cameras is to record time-lapse videos of individual plants, blooms, or trees, or an overall view of your garden or landscape over time. Certain plants only bloom for a single day, and with our busy schedules these days, we may not be at home when it happens, but with a wireless camera and recording hardware in place, the birth of that single flower can be captured on video, as seen below. Wildlife cam: See who’s been raiding your garden or burrowing through your trash at night, or catch images of local wildlife wandering through your yard with a couple of motion-activated cameras. Although you may end up with a lot of footage of raccoons (in which case you can now work to secure your veggies or garbage better), you may also end up with videos of rarely-seen critters, such as jackalopes or chupacabras or Sasquatch. Senior support: If you’ve got an elderly or infirm relative living with you, being able to view them remotely to ensure they’re doing alright can be a big help—at least in terms of relieving some of the worry or concern we might feel if they are home alone during the day. And for those who have an elderly relative living alone, consider installing a few cameras that can be remotely viewed in order to check in on their well-being. A home security camera system such as the Lorex Wire-free models that feature full 1080p HD recording resolution, crisp infrared night vision, and advanced motion detection, can do double, triple, or quadruple duty by using it to not only monitor the usual places for entries and exits from a home, but to also set it up to capture fun, interesting, or maybe even strange images from both inside and outside the house.